Bring your family and Come to Celebrate with us !! 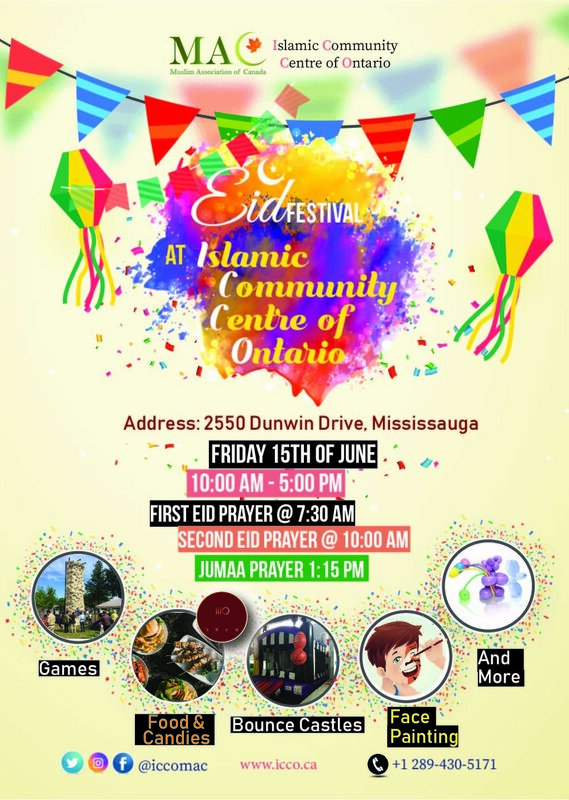 Join us and Your Family for Eid Festival at the Islamic Community Centre of Ontario !! Two Eid prayers, Games, Bounce Castles, Food, Candies, Face Painting, Balloons and more Surprises !! 2 Juma' Prayers ,Bounce castles Fundraising garage sale, Food and more ! Kids' night at the ICCO. NO BOYS ARE ALLOWED. NO GIRLS UNDER 5 YEARS ARE ALLOWED. NO PHOTOGRAPHY OR VIDEO RECORDING ARE ALLOWED. Join us at the ICCO on Saturday, July 1, 2017. Come and bring your family. Bringing the community together for a joyful Eid day. join us at the ICCO. Come and bring your family. Refreshment and snacks will be sold. No picture taking or video recording are allowed. This year, we want you to shine bright and showcase your creative work through the film medium. Film is one of the most influential media in our time today... Submit a short film you have shot, recorded and edited (either by yourself or with a group) that can be beneficial to our society. It's an open concept...you pick the topic of your choice, so long as you can portray a positive message. Share your short film to win a prize and have your film viewed at our special annual event, the MAC Sister’s Gala Dinner on January 7th, 2017! After a successful session last week, the conversation continues..
What does is take for you to love and appreciate yourself, to accept your mistakes and express yourself freely? Join Sr.Heba El-Sawah at the ICCO on May 1st from 6:00pm to 7:30pm for a new perspective and practical tips & tools. FREE session for women only, ages 18+. With a passion for inspiring people to achieve their full potential, Heba strives to maximize each individual’s inherent strengths and capabilities on their path toward self-awareness and life/professional improvement. She helps clients recognize and uncover their strengths and pursue their passion on both personal and professional fronts. Heba mainly works with individuals and families to help them grow their relationships, connect to their true selves and fulfill their dreams! Alongside direct coaching, Heba facilitates workshops and seminars to demystify positive parenting, improving relationships, and practicing safe stress. Heba has been married for 10 years and is now a mother of two children. She loves reading and writing and in her spare time, she writes sarcastic-inspirational articles that are published in a variety of reputable social magazines. MAC Sister's 14th Annual Gala will be held on January 2nd, 2016 3pm-9pm at the Mississauga Convention Centre. The event includes dinner, a talent show, skits, songs, mihajibaat awards and more. InshaAllah it will be a fun and eventful night for the sisters. We hope to see you all there. السلام عليكم أخواتي العزيزات.. تماشيا مع عنوان الحفل هذا العام نقدم لكم مسابقة أدبية للشابات من الثانوية و الجامعة..
Camp Awakening is an Islamic camp that aims to foster Muslim students to become productive members in their communities while also viewing themselves as role models within North American society. Camp Awakening provides leadership & outdoor programs for high school students. It focuses on leadership development thus enabling youth to mature as Canadian Muslim luminaries by instilling within them a sense of civic responsibility through an Islamic perspective. Choose Camp Awakening as your camp! MAC and the ICCO welcome all to join us on May 3rd for an update and fundraiser for this unique and exciting project and a special lecture by Sheikh Abdalla Idris about the history of our Muslim community and what the vision for its future should look like. There is much wisdom to be gained by listening to his many experiences. Join us on May 3rd. MAC is pleased to announce its 13th Annual Sisters Gala! Come and enjoy a fun-filled evening and good food with your friends in the largest sisters gala in the GTA! This year's program highlights are Hajaat and Mihajibat Awards, a Talent Show and skits and songs! If you are interested in auditioning for the Talent Show please fill in the application at: http://goo.gl/forms/inXsab2ysy. Purchase your tickets now, early bird prices are only valid until December 28! Bring your friends and family! We look forward to seeing you all! The despicable atrocities of the falsely self proclaimed Islamic State(Isis) have constantly made headlines in the past year, leaving some wondering is this what Islam represents? Join us 6pm on Saturday, the 20th of December at the Islamic Community Centre of Ontario where the renowned Islamic thinker and intellectual Dr. Jamal Badawi will demonstrate how the murderous and twisted ideology of the false Islamic State is not only unIslamic, but in fact anti-Islamic. Dr. Jamal Badawi is an Egyptian born Muslim Canadian. He is a former professor who taught at a number of schools including the Sobey School of Business, Saint Mary's University in Halifax, Nova Scotia, where he taught in the Departments of Religious Studies and Management. He is a well-known author, activist, preacher and speaker on Islam. Dr. Badawi completed his undergraduate studies in Cairo, Egypt and his Masters and Ph.D. degrees at Indiana University in Bloomington, Indiana. We pray this message has reached you in the best states of health and Iman. Join us on November 22 for our fundraising dinner at the Lakeshore Convention Centre. 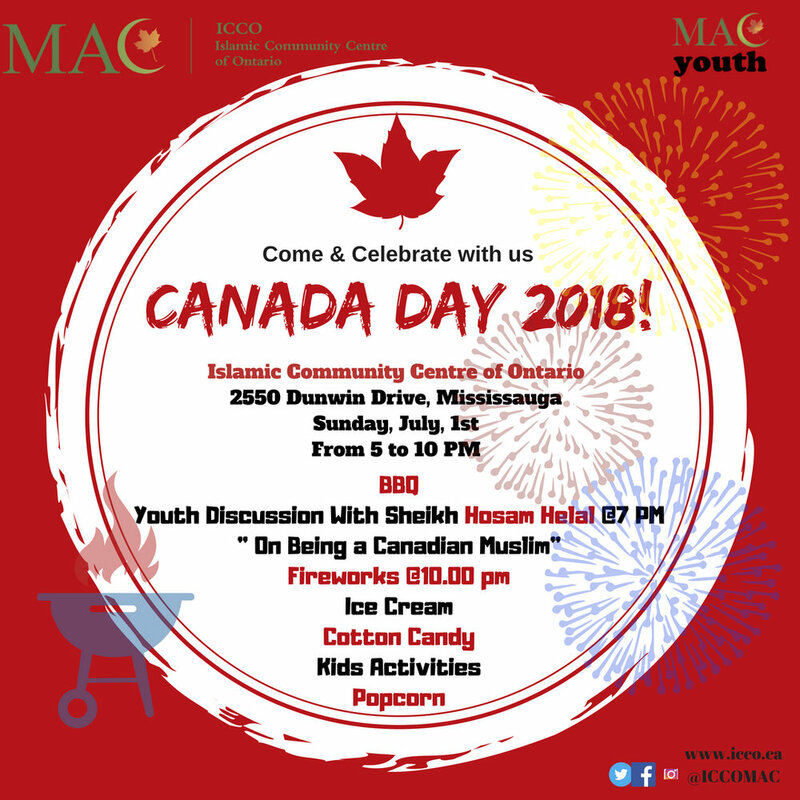 The event will feature a program for kids which includes an animal show, a clown, face painting, henna, movies and an Islamic knowledge competition with fabulous prizes. Don't miss out on this great opportunity to attain the immense reward of Sadaqa Jariya. Invest in your future in this life and the next. We hope to see you, your family and friends on the 22nd! As the hajj season comes to a close and the pilgrims in Mecca prepare to make the journey to mount Arafa, the ICCO welcomes you to a potluck dinner to share in the blessings of a community meal on this holy day. We will begin promptly at 6:30 with a short reminder followed by duaa, and then inshaAllah enjoy in the many dishes to be served. Come out with your friends and families and partake in this event. May Allah accept the pilgrimage of those people who had the beautiful opportunity to perform it and may He grant the rest of us the joy of experiencing it soon insha’Allah. The ICCO is pleased to invite you to our End of Summer Family BBQ. What better way to end off the summer break than with a family BBQ at the ICCO! This isn’t just any BBQ, this BBQ will have something that no other family bbq has had: ASTRONOMY IN ACTION! An interactive, educational show that uses portable planetarium technology to give an immersive Astronomy experience to people of all ages. We will have 3 one hour shows in the dome: Family (all ages), youth sisters, and youth brothers. Don’t miss out on this experience! BBQ starts at 2:30pm, first show in the dome is at 4pm inshallah. Limited spots. Register for planetarium dome at www.enrich-it.ca for $5 or pay $8 at the door - if spots available. Limited spots. Register ASAP at www.enrich-it.ca by clicking on the top right hand corner “Register Here” and choosing the ICCO option! As Muslims we must constantly be working to develop ourselves and move forward in order to achieve new heights and become better people. Are we really developing? No successful person became that way without a plan! Join us at the ICCO where you can learn how to develop yourself through building and collaborating on plans. This event is for ages 18-25. starts at 630pm at the ICCO. What better way to start off your post-Ramadan summer than a fun night with friends at scooters? Join us and bring your friends to a place where you can eat, roller blade, socialize and be stress free! There will be separate times for sisters and brothers inshallah. $11 for 1.5 hours and rentals. Please register below and bring your money to pay on the day of! Imagine hopping out of bed, and knowing that you will automatically do what ever it takes to create success - just as mindlessly as you brush your teeth. Have you ever wondered what some of the things that differentiate successful from unsuccessful people are? Come out to the ICCO to understand the power of a habit, and learn how to develop and track habits that will lead towards success. This workshop is for ages 14-17. Join us at Airborne Trampoline for an evening of fun and excitement with your brothers and sisters at Airborne Trampoline. The ICCO has a private booking meaning there will be nobody else from the public, just our group This event is for ages 14-18. We will have separate hours for brothers and sisters. Sisters will go at 6 PM while brothers will begin at 7 PM inshaAllah. There are limited spots so please register as soon as possible at enrich-it.ca ! Exciting, interactive, and hands-on activities by Mad Science for children to enjoy while learning Science like never before! Make sure to register soon as spots are limited. Venue: ICCO. 2550 Dunwin Drive, Mississauga ON. Age: Grades 1 to 6. A spiritual and fun night for your children to enjoy and benefit from. The night includes iftar, activities, bon fire, sports, Tahajud prayer, Qur'an recitation and a lecture! Date: Sunday July 20th-Monday July 21st. Time: 8:30 pm (Sunday)-4:00 pm (Monday). MAC Connect Presents: Women's Qiyam- "Purification of the Heart"
Mac Connect is hosting a sisters Qiyam at the ICCO on Friday July 11. Bring your friends and family and join us in a night of sisterhood and spirituality where we seek to purify our hearts as taught by our beloved Prophet Muhamed peace and blessings be upon him. 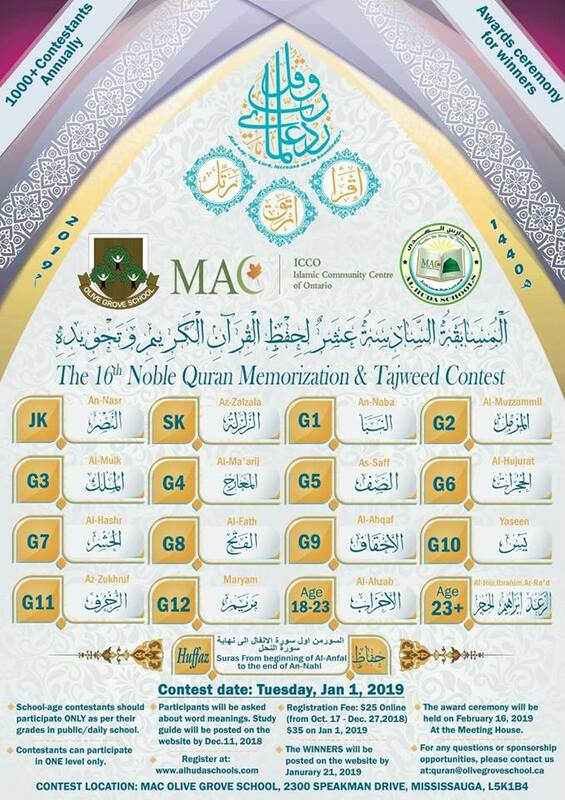 The night will include lectures, workshops, Quran recitation and tahajjud prayers. This program is intended for sisters in the post-secondary/young professional levels. The program will begin at 11:55 PM and end after Fajir prayers inshaAllah. Please bring $5 to help cover suhoor costs. In this blessed month, we invite you all to MAC Connect's second annual Ramadan Iftar. We will have brother Fiyyaz Jaat give a talk in the masjid before Iftar. Admission will be $10 and we will begin promptly at 7:30 PM inshaAllah. Arrive on time and receive a raffle ticket for our special Ramadan gift. Please RSVP to help us account for food. We pray you are all having a blessed Ramadan and hope to see you on the 16th! For those who prefer to pay in cash, please fill out the google form below and note that the payment must be received in person at the ICCO by Wednesday July 9th or you will lose your spot. Feel free to contact Lama Ayyoub for any questions and/or concerns at l.iayyoub@gmail.com. For Ages 14-25, Separate Brothers & Sisters Workshops. Bring your family and friends to the ICCO every Friday in Ramadan for a free community iftar & Friday market. Enjoy a fun, spiritual night with the community! Join Us In Welcoming Ramadan At The ICCO! Join us for the unveiling of the ICCO architectural design. Your future Masjid, Community Centre, and Second Home.